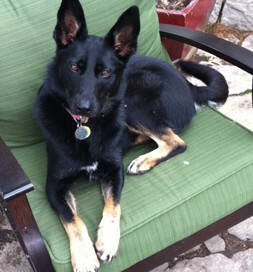 From a distance comes the sound of a fire engine, and Izzy, a German Shepherd mix, begins to howl in concert with it. Izzy keeps an eye on things. Izzy certainly has a story to tell. Her first months were spent under a house, and she was a victim of beatings. Eventually she was surrendered to a rescue group, then was brought to Pet Haven in Minneapolis, who placed her in a foster family. On her first trip to meet Marta, Izzy explored and learned that she could circle through the dining room, kitchen and back into the living room. “Every few seconds she would pop in, ‘Here I am again,’ again, again,” Marta recalls. Such a personality was impossible to resist, as was the big grin on Izzy’s face each time she popped in, and Marta finalized the adoption. At first she was a dog who kept to herself, but gradually she blossomed as Marta expanded Izzy’s world to obedience classes and trips to the dog park. Izzy’s “story to tell” continued at the dog park. “She once helped find a lost dog at the dog park (over six acres of woodland). I’m not sure how she understood what she was being asked for, but she did,” Marta says. This spirited and playful dog exemplifies how adoptable dogs are gems with their good stories waiting to unfold.